Dozens of Israeli soldiers invaded, on Sunday at night, Silwad town, northeast of the central West Bank city of Ramallah, and fired many rubber-coated steel bullets, gas bombs and concussion grenades at local protesters. 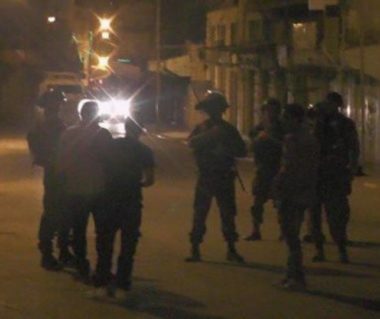 Media sources in Ramallah has reported that the soldiers also closed the entrances of the village, and prevented the Palestinians from entering or leaving it. The soldiers also stopped and searched dozens of cars, and interrogated the Palestinians while inspecting their ID cards. In related news, a Palestinian man was seriously injured after a speeding Israeli colonialist settler rammed him with his car near Ni’lin village, west of Ramallah.